The Toyota FJ Cruiser is a serious off-road beast that does periodically needs maintenance like any vehicle. 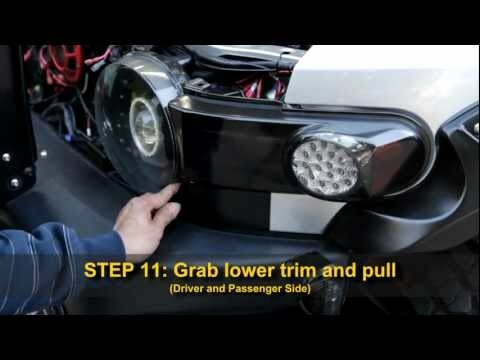 In this guide, we will discuss how to replace a headlight bulb and also how to remove the entire assembly. Here is how to do it. Having properly working headlights is important to not only your driving, but other drivers as well. Prior to beginning this repair, you will need to make sure you find a suitable place for the repair, allow yourself plenty of time and make sure you have plenty of light. Many a repair has been rushed and done incorrectly due to not having these items. Also, make sure you have a collection of tools such as screwdrivers and needle nose pliers. Lastly, be extra careful when installing a new bulb, the grease from your skin can shorten the life span of the new bulb. It is preferable to wear gloves to avoid damaging the bulb. Switching out an old bulb for a new one is a pretty straightforward procedure. Find the headlight you want to switch out. Locate an electrical connection running to the back of the headlight. Typically it will have a disconnect end near the bulb. Disconnect the electrical plug and locate a rubber housing. The rubber housing is a moisture guard. You should now be able to the rear of the light bulb. Carefully use your fingers on the metal end to pull the bulb out. Insert the new bulb and reverse the directions above. The headlight is part of an assembly that includes the turn signals. It is also attached to the front grill and you will need to loosen this grill to free the assembly. Locate the screws along the top of the grill and remove them. Next, locate the clips that hold the grill to the engine bay. Pop any remaining plastic clips off and free the grill. Next, locate and remove the three screws that hold the headlight to the frame. Then, locate all the clips that hold the headlight assembly to the grill and pop them free. Find the electrical connectors on the back of the headlight and turn signal bulb, remove them. If you removed all the screws and clips, you will now be able to take off the headlight assembly. Having all your lights working properly on your FJ Cruiser is important to the safety of your vehicle when driving. Make sure you check your lights periodically to ensure they are all working properly.